VANCOUVER, BC, March 17, 2010 – Mirasol Resources Ltd. (TSX-V: MRZ, Frankfurt: M8R) is pleased to announce the start of the Phase 4 drill program at its Joaquin silver-gold project in Santa Cruz Province, southern Argentina. Coeur d’Alene Mining Corporation (NY:CDE and TSX:CDM,”Coeur”), Mirasol’s joint venture partner and the project operator, recently announced plans to spend US $3.3 million during 2010 in step-out drilling and further exploration at Joaquin (see Coeur’s February 25, 2010 press release and web presentation). Mirasol also wishes to report final results for the Phase 3 drilling campaign at Joaquin, completed in late November, 2009. Total metres drilled at the Joaquin project to the end of Phase 3 are 8,611 metres in 63 diamond drill holes. Coeur holds an option to acquire up to 61% interest in Joaquin through exploration expenditures and by completing a bankable feasibility study, and a further 10% to reach 71% interest if project financing is provided at the request of Mirasol. The Joaquin project is located in the Area of Special Interest for Mining in Santa Cruz, Argentina where mining development is favoured and four precious metal mines are currently operating. The Phase 4 drill program at Joaquin will explore for extensions to the known mineralized zones at the La Morocha and La Negra targets, and further test the La Negra high-grade silver zone. 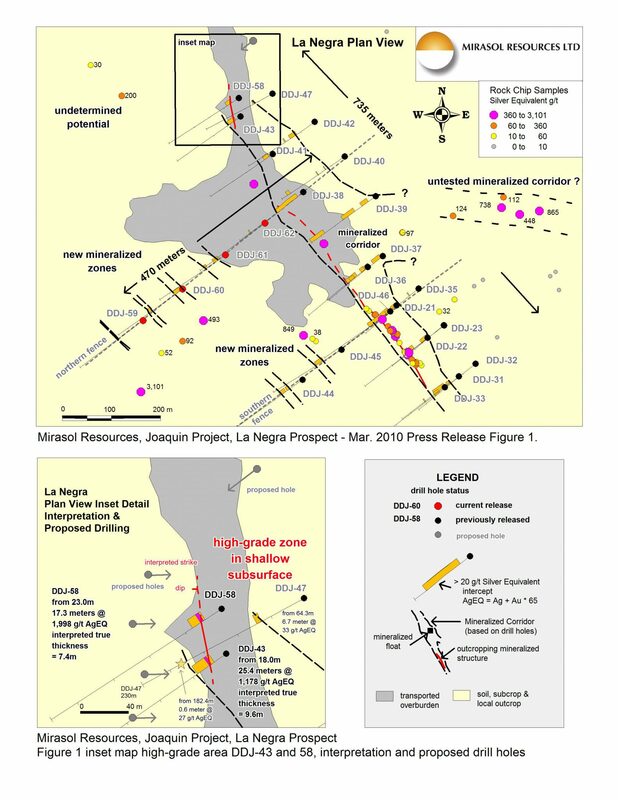 The Phase 4 program will commence with 100 metre step out holes on trend to the north of the La Morocha and La Negra mineralized trends. Similarly spaced holes are proposed to the east and west of La Negra to test newly identified high-grade outcropping silver mineralization (news release of Jan. 11, 2010), and to further explore covered parallel silver trends discovered in Phase 3 drilling. It is anticipated that Phase 4 drilling may include infill holes between the widely-spaced drilling that has been done to date. As part of the Phase 4 program, four closely-spaced holes (35 – 45 metre spacing) are planned to test the high-grade silver vein discovered in holes DDJ-43 and 58 at the present northern limit of the La Negra silver trend (press releases of Nov. 24, 2009 and Jan. 11, 2010). These holes are sited from west to east to test the interpretation that the high-grade, zone is steeply west-dipping. This drilling should allow better estimates of the true thickness of mineralization in holes DDJ-43 and 58 which are at present estimated at 9.6 and 7.4 metres, respectively. Final assay results have been received for the last five holes of Phase 3 drilling, bringing to a close the reporting on 4,338.5 metres in 25 holes drilled during this phase (Table 1). The new results include four holes that were drilled to further test soil-covered mineralized trends parallel to the western side of the principal La Negra silver zone. Additional sample results from hole DDJ-55 at La Morocha are included (Table 2). All four new holes at La Negra (DDJ-59 to DDJ-62) have intersected silver-mineralized structures of variable grades and widths (Table1 and Figure 1), including a best down hole intersection of 27 metres from surface, which returned 55 grams per tonne (g/t) of silver equivalent including 3.5 metres of 143 g/t silver equivalent. Intercepts confirm the presence of new silver mineralized trends in a largely soil-covered area west of the La Negra main zone, and suggest the combined width of the La Negra mineralized corridor may reach up to 470 metres as defined by multiple parallel silver – gold trends. – Silver equivalent is calculated as AgEQ g/t = Ag g/t + 65 x Au g/t. Metallurgical recoveries are unknown and therefore assumed to be 100%. – Primary intersections are calculated at a cutoff grade of 20 g/t silver equivalent (AgEQ) with some internal dilution allowed at the discretion of the project’s Qualified Person. – Estimated true widths have not been calculated. At La Morocha, new assays of previously unsampled sections of the core from hole DDJ-55 increased the mineralized intercept in the hole to an estimated true width of 39.3 metres, containing 123 g/t silver and 0.10 g/t gold, or silver equivalent of 129 g/t (Table 2, and news release Jan. 11, 2010 for hole location). DDJ-55 confirmed a wide zone of good grade mineralization exists between prior holes spaced 160 metres apart. – Results for DDJ-55 were published on Jan.11, 2010, but additional sampling of previously unsampled core has shown that the mineralized zone was longer than originally thought and hence has been recalculated and published here. – Estimated true width is 39.3 metres. The Nico project, also located in Santa Cruz province, has been returned to Mirasol by Coeur and the Nico joint venture will be terminated. Mirasol intends to review the exploration results obtained by Coeur and to seek a joint venture on the Nico property. Mirasol’s management is highly encouraged by results from the Joaquin Project’s Phase 3 drilling program received from November, 2009 to the present. To date, Phase 3 drilling has confirmed more than 735 metres of mineralized strike length in two targets that remain open at depth and along strike to the northwest, containing wide intercepts of significant silver at La Morocha, and high grade silver-(gold) mineralization hosted in the La Negra corridor. Mirasol believes the large programmed 2010 expenditure and the rapid start to the Phase 4 drill program initiated by its joint venture partner Coeur demonstrate confidence in the Joaquin Project’s potential. All assay results reported herein are for diamond drill core samples; assay results from RC (reverse circulation) drill samples or surface samples may be higher, lower or similar to results obtained from drill core.